Publishing House for Art, Architecture, Design & Art Theory. Julia Faber’s hyperrealistic painting is concerned with themes of the formation and disciplining of bodies, through citations of classical mythological motifs and illustrations of forced pedagogical regulations of the body from textbooks and newspaper advertisements from the 19th century. With effectively deployed moments of horror, overwhelming the viewer with a mix of cynicism, wit and exaggeration, and all executed with an almost uncanny technical mastery, Faber takes past and contemporary gender stereotypes to the extreme, whilst at the same time dismantling the rules of taste of an over-sexualized, body-obsessed society. She happily places herself in the picture and, with mischief and irony, reflects her role as a woman artist in relation to the traditionally male-dominated field of history painting. Her staged, outlandish liberation of the body from the constraints that religion, society and education set upon it casts a confusing, critical light on the viewer. 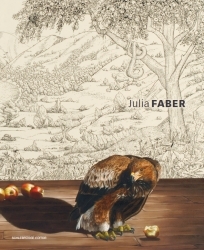 Julia Faber was born in Vienna and studied painting at the University of Applied Arts Vienna under Johanna Kandl. She lives and works in Vienna.